Born to be portable, just at 212.5 mm width, 57.5 mm height and 10 mm thin, it weighs in at just 200g. With the absence of a screen, we introduce the concept of ’bring your own display’ - use your iPhone, iPad or Computer, because the OP-Z is built for people on the move that already carry a great display in their pocket. 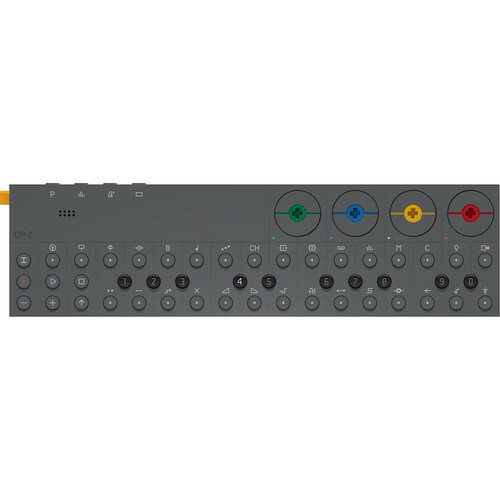 Packed with multiple synthesizer engines, beats, samples, effects, visuals and preset patterns, the OP-Z has the ability to control up to 16 lights through DMX, it has a Unity 3D® integration to let you interact with your own 3D worlds, as well a built in photomatic feature which allows you to instantly sequence images taken with your smartphone camera. More… the OP-Z has an expansion slot for modules that will add a range of hardware upgrades, each with its own unique functionality. Complete the OP-Z universe with a range of teenage engineering accessories like the bespoke design leather case. OP-Z, ready to be used anytime, anywhere, straight out of your pocket. 160 user programmable patterns patterns chaining. delay, reverb, filters, tremolo etc. act as a screen for OP-Z.